YOU DO NOT NEED TO BRING ANY MATERIALS WITH YOU TO THIS CLASS !!! Your training fee includes four (4) full days of intensive training, PLUS the Sisterlocks Business Packet mailed to you, including samples of our products. After successful completion of the course you will be listed on our official online Trainee Registry. All of your training supplies for the class will be provided, including your mannequin head and holder along with all necessary clips and clamps. Q. Do I have to be a cosmetologist or hair stylist to take the 4-Day Sisterlocks training class? A. 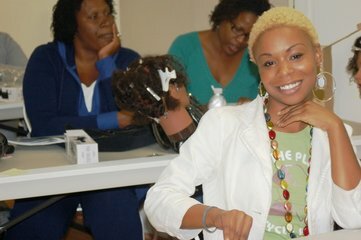 You do not have to be a cosmetologist or hair stylist to take a Sisterlocks class. Laws for practicing natural hair care vary from state to state however, so check in your area. Read about our landmark court victory that cleared the way for natural stylist in California, and also set a precedent in many other states. Q. Do I get my money back if a class is cancelled? A. ​Your domestic class payment for all cities except New York, includes a non-refundable $250 deposit, EXCEPT if the class is cancelled by Sisterlocks. In that case, you will be fully refunded. ALSO, if you are not able to attend the original class you registered for, your deposit and any other monies paid toward that class, are transferable for ONE year from the date of the original class to any other class. This is a ONE TIME ONLY opportunity. Deposit amounts and conditions for international classes may vary. Check the individual class page for details. More for information review our Refund Policy. Note: Stimulus Package classes operate differently. Students save $250.00 off of the regular tuition costs, otherwise the class content is identical. A. ​We generally have between 10 and 20 students. If the class gets too large, we split it into two sections so that everyone can benefit from the individualized attention that sets Sisterlocks above other training programs. Q. ​Do I become a Certified Sisterlocks Consultant at the end of the class? A. ​Taking the class does not result in immediate certification. After taking the class you are a "Trainee." (You can still refer to yourself as a "Sisterlocks Practitioner.") To become certified you are required to submit documentation on three (3) qualifying clients (ie. not children or relatives). Once our evaluators have reviewed your work, interviewed your qualifying clients, gotten clarification on any questions they might have, and helped you in various ways to meet our standards, you become a Certified Sisterlocks Consultant. The process can take up to several months. Q. ​What if I can't pay the full amount for the class all at once? All classes must be paid in full five (5) days before the class date. Note: Stimulus package classes operate differently. Consult each of these classes individually. Q. ​Since the classes go four (4) days, are meals included? A. ​In a few cases, our international classes may include meals, but as a rule the classroom offers coffee and tea only. Students are given a 15-minute morning break, a one-hour lunch break and a 15-minute afternoon break. Classes are usually in hotels with eating facilities, and/or near off-site restaurants. When enrolling in our classes you will simultaneously enroll in our new Online Academy. You will see a prompt for this after making a Deposit or Full Payment for any class. Anyone can also create an Academy login profile at any time by going to www.trainingsisterlocks.com. The Academy is a way for us to more effectively provide materials, track progress, provide a networking forum and follow-up activities for our students. We've made it as easy as possible to register and make payments. All payments can be made through the link below, so bookmark this page or add it to your "favorites" and come back here to make all of your installment payments. You can also register for ANY future class - posted or not yet posted - via credit card by phone at 1-800-456-5032 (Leave message for a call-back) (Overseas Callers: 619-291-5808). Click here to see The 2019 Training Class Schedule.